Indian cooking is an astounding resource of healthy, economical and delicious new dishes, ingredients, techniques, styles, spices and flavors for vegetarians. Good for the body and spirit, and easy on the bank account, Indian cooking has become a life-changing revelation for many of us. But as exciting as it is, the unfamiliar and exotic names of these ingredients and techniques can also be intimidating to the vegetarian who is just beginning to explore Indian cooking. I speak from experience as someone who had never even tried Indian food until adulthood — my own journey into Indian cooking began with confusion and many stumbles, and even after many years I am still discovering new aspects. This food blog has been an attempt in part to share my love of and appreciation for Indian cooking to vegetarians who are looking for creative and healthy ways to eat — regular readers will certainly have noticed the emphasis on Indian recipes. This glossary of Indian ingredients, dishes and techniques is meant to help guide those readers who are new to Indian cooking, or to provide a quick assist to cooks who just want a quick hint or refresher. The lists provided in this glossary are by no means exhaustive — there is an almost inexhaustible range of regional cuisines within India, each of which has its own variations and unique ingredients, dishes, methods and names for these that such an attempt could fill several books. Instead, I have attempted to provide the most common items in each category, and those ingredients which we are most likely to be able to find in an neighbourhood Indian grocer. Given the increasing popularity of Indian cooking, many of these ingredients can now be found in ordinary supermarkets as well. Common Indian names in this glossary are provided in italics, but please note that there are almost as many different names for each ingredient as there are regions in India, and spellings may differ (transliterations from Indian characters vary considerably). Please feel free to contact me if you have any questions or suggestions for items that I have not covered. Finally, although I hope that readers will find this glossary helpful, there really is no substitute for immersing yourself in the experience of the Indian grocers that are now found in almost every urban area of North America and beyond. I invite you to browse through these stores, inhale the intoxicating aromas along the shelves, ask questions, and pick up any unfamiliar ingredient or implement, most of which are extraordinarily affordable — take them home, experiment, learn and have fun! In Hindi, "dal" translates literally as "split bean", but in general usage the word refers not only to any dried bean, pea or lentil — split or whole — but also to any cooked dish of legumes or pulses. The word may also be found spelled as "daal", "dhal" or "dahl". India is the world's largest producer and consumer of legumes. For most Indians, dals are the most significant source of daily protein, and dals are consumed every day and with almost every meal. Most dals have a mild flavor and for this reason are very versatile ingredients — when cooked in curry dishes, dals will absorb the flavors of spices and vegetables. Dals are also sprouted, ground into flours, or fried for use in spice blends or as a tempering — the latter use is most common in south Indian cooking. Dried dals are an extraordinarily affordable source of protein for vegetarians — you can try out different dals at very little cost at your local Indian grocer. Consider stocking an essential Indian pantry with toor dal, channa dal, skinless urad dal, split mung dal and chickpeas. Dried dals have a very long shelf life, but the older they are the longer they will take to cook — avoid dals with shriveled skins. Dried dals should be rinsed before cooking, and split dals may also need to be sorted to remove small stones. I have included recommendations for soaking dals before cooking, but many small dals — especially many split dals — cook very quickly and do not need to be soaked. Dals are usually cooked by bringing to a boil, then reducing heat to low or medium-low and simmering until tender. Small oval beans resembling red mung or urad beans, azuki beans have a sweet taste and creamy texture. Cooked with spices in some north Indian dals, azuki beans should be soaked for at least 6 hours before cooking. Mung or whole urad beans can be substituted for azuki beans. A high-protein flour made from ground chickpeas with a nutty aroma and flavor, besan is used to make batters for fried Indian appetizers like pakoras and bhajis. Besan is also used in breads, usually blended with other flours, and as a thickener. Freshly ground besan keeps in air-tight containers for as long as 6 months — however, store-bought besan should be refrigerated or stored in the freezer. A smaller and dark-skinned cousin of chickpeas, black chickpeas have a denser texture and stronger, earthier aroma. Black chickpeas should be soaked for at least 8 hours before cooking. Black chickpeas are cooked with other strong flavors in thick and hearty curries. 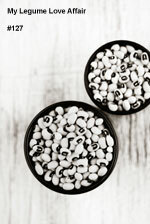 A pale, medium-sized and kidney-shaped bean with a small dark spot or "eye" on one side, black-eyed peas are also widely used in Africa and the southeastern United States. Black-eyed peas have a nutty aroma, a creamy texture, and an earthy and buttery taste. Black-eyed peas should be soaked for at least 8 hours before cooking. Black-eyed peas go well with onions, garlic, and ginger, and are suitable for curries with tomatoes or cooked leafy greens. A split version of a smaller but stronger-flavored cousin of the chickpea, channa dal has a sweet corn-like taste and is a very popular dal in India cooked with spices, onion, garlic or tamarind. Channa dal should be rinsed and soaked for 2-4 hours before cooking. Large pale peas with a creamy texture and nutty flavor, chickpeas are well-known throughout much of the world for taste and versatility. Chickpeas should be soaked for at least 8 hours before cooking. Cooked chickpeas absorb spicings and flavorings, and are widely used in Indian curries and raitas. A smaller variety of chickpeas is ground to make besan flour. Primarily used as cattle feed, horse gram is also a staple in rural south India where it is cooked in dals or sprouted. Small and greenish tan-colored beans, horse gram has a strong earthy and slightly sweet flavor. Horse gram should be soaked for at least 8 hours before cooking. Large red kidney-shaped beans with a delicate but earthy flavor and full, meaty texture that — like chickpeas — are well-known throughout much of the world. Kidney beans should be soaked for at least 8 hours before cooking. Kidney Beans are used in popular North Indian dark curries that are often called simply "Rajma". Small greenish tan-colored beans, moth beans are sold whole or split and have a rich, earthy and nutty flavor. Moth beans are popular in Maharastrian cooking, where they are often cooked with spices and coconut or sprouted. Moth beans do not require soaking. Small, round green-skinned beans with a delicate slightly sweet and slightly earthy flavor, mung beans have a lovely chewy texture when cooked. Mung beans should be soaked for at least 6 hours before cooking. Mung beans go well with tangy flavors such as tomatoes, tamarind and lemon. Sometimes known simply as "lentils", red lentils are a very small split bean with a delicate slightly sweet and slightly earthy aroma and flavor. Red lentils should be rinsed but do not need to be soaked, and cook in as little as 15-20 minutes. Red lentils go well with strong flavors such as onions, garlic, tamarind and spice blends. Split mung beans with or without the skin. Light yellow in color, mung dal should be rinsed but does not require soaking, and cooks quickly. Cooked split mung dal is creamy and very easily digestible, and is often fed to infants. Split mung is often soaked overnight and ground to make a pancake batter. Dried split green or yellow peas have an earthy flavor and chewy, hearty texture. Split peas are cooked with spices and added to rice dishes, but are less frequently used as the main part of a dal curry. Split peas should be rinsed but do not require soaking before cooking. Yellow-orange medium-sized split beans with a lovely slightly sweet and nutty flavor, toor dal is among the most popular of dals in India, and is a staple of South Indian kitchens especially. Sold dry or coated in castor oil, toor dal should be rinsed and soaked in hot water for at least 2 hours before cooking, after which it cooks quickly. Easily digestible, toor dal goes well with spices and vegetables, and is the basis of South Indian "sambars". Small, round and dark-skinned beans with a rich and earthy aroma and taste, urad beans become very glutinous with cooking and add a very creamy texture to curries. Whole urad beans should be soaked for at least 4 hours before cooking. Urad beans are cooked with kidney beans to make the popular North Indian dark curry called "Dal Makhni". Split urad beans with or without the skin, urad dal is an excellent dal for absorbing spice and vegetable flavors. Urad dal is often fried without soaking or cooking beforehand in combination with aromatic seeds and spices for tempering vegetable curries. Pale white inside, urad dal with skins have a strong earthy flavor, while skinless urad dal has a floury aroma and very mild taste. Urad dal should be rinsed but does not require soaking, and cooks quickly. If dals are the workhorse of Indian vegetarian cooking, spices are its breath and life. Added in one form or another to almost every Indian preparation, from breads to breakfasts and from snacks to dinners, spices are what most of us think of when we think of Indian food. Spices may be cooked, fried, roasted, added as finishes, ground to powders or pastes, or blended for use in countless variations. Many spices are also considered to have digestive or healing properties. Every region of India has its own spices and names, its own blends, and its own techniques for using spices. I attempt to list the most common spices and spice blends with their most occurring names, but you will find many more at an Indian grocer. Good commercial spice blends are also readily available, but most are very easy to prepare at home and there are thousands of recipes to suit your own tastes. In this section I also list other items commonly used for seasoning Indian food, including herbs, roots and aromatic leaves, and other flavoring agents. Dried spices, seeds and herbs have a very long shelf life, but slowly lose flavor and aroma over time — store these in airtight containers in a cool dark place. They lose their flavor and aroma more quickly once ground — where possible, buy your spices in whole form and grind or powder just prior to using in a coffee grinder or mortar and pestle. Consider stocking an essential Indian pantry with coriander seeds, cumin seeds, dried red chilies, black mustard seeds, turmeric, dried curry leaves, asafoetida, cayenne, cinnamon, cloves, black peppercorns and tamarind. Small brown seeds resembling caraway or cumin seeds, ajwain seeds have an aroma and flavor like thyme but are much more pungent as well as slightly more bitter. Dry-roasted or fried ajwain seeds are used sparingly in breads, batters and vegetable dishes owing to their strong and biting taste. Ajwain seeds are not typically ground or crushed, and are used as a digestive aid. Amchoor is a tart, tangy and astringent powder made from unripe green mangos, and is used as a souring agent in dals, soups, vegetable curries, chutneys and pickles. Amchoor powder is the most important ingredient in chat masala, and a small amount can be used as a substitute for lemon juice in many recipes. Ground dried pomegranate seeds, anardana is used similarly to amchoor as a souring agent in dals, vegetable curries and chutneys, but has a heavier and more astringent taste than amchoor. Asafoetida is the ground dried resin from the root stem of a species of fennel. Very pungent and almost foul-smelling when raw, asafoetida's odour recedes when heated. Used in very sparing pinches, asafoetida is fried only briefly in hot oil to impart an essence similar to onions and garlic, and is used often used in place of those ingredients in dals or vegetable curries. Most asafoetida sold in Western grocers is compounded with wheat or rice flour and gum arabic. Small brown or black oval-shaped seeds, black cumin adds a bittersweet aroma and flavor suggestive of a slightly burnt caraway to dals, rice dishes and vegetable curries. Tiny dark brown or black seeds with a pungent aroma and a sharp, acrid taste, black mustard seeds are added to hot oil and heated until they "pop" to start a recipe or to make a seasoned oil to pour over dishes. Black mustard seeds are most frequently used in rice dishes and pickles, although they may be added to many dals, curries or chutneys. Yellow mustard seeds are also used in pickles. A dark reddish-gray salt, rich in minerals and with a smoky aroma and tangy taste, black salt is often used in sweet and sour savouries or vegetable curries as it imparts more tang than ordinary salt. The pod of a perennial bush related to ginger, green cardamom — known as the "Queen of Spices — is picked just before ripe and dried. Very fragrant and with a zesty, lemony taste slightly suggestive of eucalyptus, cardamom pods are crushed or ground into powder and are used to flavor rice dishes and Indian sweets. Black cardamom pods have a deeper and more peppery flavor, and are not used in sweets. The light-colored dry leaves of the tropical Cassia tree are added to the cooking liquids of dals and vegetable curries to impart a sweet and earthy fragrance with a hint of cinnamon, and are discarded before eating. Ordinary bay leaves may be substituted. The ground powder of sun-dried red chilies, cayenne varies in the intensity of color and heat depending on the variety of chili pepper used, but is always very hot. Cayenne is used in almost every spicy rice, dal or vegetable dish throughout India, and is an essential ingredient in an Indian cook's pantry. A hot, tangy and spicy blend that is usually used to season chickpea or potato dishes. The basic ingredients of channa masala include coriander seeds, cumin seeds, dried red chilies, black salt, and amchoor. Commercial blends are available in Indian grocers, but a recipe for homemade channa masala can be found here. "Chat" means "to snack", and the tart, salty and spicy chat masala spice blend is popular throughout India for making potato and fruit snacks. The basic ingredients of a chat masala are amchoor, black salt and ground cumin, but other spices are also added. Good commercial blends are sold in Indian grocers, but an easy homemade recipe can be found here. Various kinds of chili peppers ranging in heat and intensity are used in almost every savoury dish in India, from dals, rice dishes and vegetable curries to pickles and chutneys. Red chilies ( lal mirch ) are ripened green chilies ( hari mirch ), and are subsequently slightly milder and usually dried for use. Most of the heat in chilies is found in the seeds — these can be scraped out for a milder sensation. The most common chili in Indian recipes is a narrow finger-length variety usually called simply "green chili" — these are sold in Indian grocers, but green cayenne peppers can be substituted. While jalapeños are not widely used in Indian cooking and are milder, they can be substituted as well. Green chilies may be fried, cooked, ground to a paste with other spices, or added fresh to dishes. The dried inner bark of a tropical tree, cinnamon is sold in rolled pipes or ground to a powder. Cinnamon has a warm, sweet taste and a sharp, sweet and citrus aroma. Cinnamon is used in sparing amounts in rice dishes, dals, vegetable curries and Indian sweets and desserts, and is the essential ingredient in garam masala. Most cinnamon sold in Western grocers is actually the dried inner bark of the related and more abundant Cassia tree, which — although less expensive — has a less rich and slightly more astringent flavor. Small, black and nail-shaped, cloves are the dried buds of a tropical evergreen tree. Very fragrant with a sharp, peppery and fruity flavor, whole cloves are used to flavor rice dishes but are discarded at the side of the plate when eating. Ground cloves are used in some spice blends and to flavor desserts. Pungent, peppery and zesty, chopped fresh coriander or cilantro leaves are used to season or garnish almost every kind of savoury dish in India, especially spicy dals, rice dishes and vegetable curries. The small, round greenish-gray seeds of the coriander or cilantro herb, coriander seeds have a spicy, peppery and woody flavor and aroma. Crushed or ground coriander seeds are a major component of numerous spice blends throughout India — very often with cumin seeds — and are frequently dry-roasted to enhance the sharpness of the flavor. Coriander seeds are used in many dals, soups, vegetable curries, and rice dishes. The small, oval greenish-brown seeds of an herb in the parsley family, cumin seeds have a strong, warm and spicy flavor and aroma. Cumin seeds are fried in hot oil or dry-roasted, and added to dals, rice dishes and vegetable curries. Ground cumin seeds are an essential component of many spice blends, very often with coriander seeds. Small, pointed dark-green leaves of tropical citrus tree, curry leaves have a slightly bitter curry flavor and are used generously in south Indian dals, rice dishes and vegetable curries, usually fried in hot oil to start a recipe or for a seasoned tempering. Dried curry leaves are occasionally added to spice blends. Often discarded from dishes before eating, they are nevertheless palatable. Fresh curry leaves are often available from Indian grocers, but dried leaves can be substituted although they are less fragrant. A generic term for mild to hot spice blends, usually containing dried red chilies, turmeric and some combination of cumin seeds, coriander seeds, fenugreek seeds, peppercorns, curry leaves, or other seasonings. Commercial curry powders are convenient for making quick curries. Chopped fresh dill is used to garnish dals and salads, especially chickpea dishes. Fresh dill is also occasionally cooked as a leaf vegetable in dals and vegetable curries. Dried dill seeds are also occasionally crushed or ground to flavor breads, dals or vegetable curries. Sold whole or crushed in flakes, sun-dried red chilies vary in heat depending on the variety of chili pepper used, but are far hotter than fresh chilies. Most of the heat is found in the seeds, which can be removed to reduce the intensity. Dried red chilies are dry-roasted, fried in hot oil, or soaked and ground into a paste, and used to season dals and curries. Yellowish-green seeds slightly larger than cumin seeds, fennel seeds have a strong, sweet licorice flavor and aroma. Fennel seeds are fried or roasted, and are particularly good in potato dishes. Fennel seeds are used as a digestive aid and an appetite stimulant, and are often chewed after dinner to freshen breath. Small and green with a bitter but tangy taste, fresh fenugreek leaves ( hari methi ) can frequently be found in Indian grocers and are added to batters, doughs and salads, or cooked like baby spinach and added to dals or vegetable curries. Dried fenugreek leaves ( kasoori methi ) are widely used for sprinkling over dals and vegetable curries, and may be used as a substitute for fresh leaves during cooking. Baby spinach leaves may also be substituted along with a pinch of ground roasted fenugreek seeds. Small, square and hard yellow, fenugreek seeds are actually the dried legumes from the pods of the fenugreek plant. Pungent and bitter, fenugreek seeds are dry-roasted or fried briefly to temper the flavor, and are used whole or ground in breads, dals, vegetable curries, chutneys and pickles. One of the most famous and widely used of Indian spice blends, garam masala is a very fragrant, slightly sweet and warming seasoning added at the end of recipes to finish dals and vegetable curries in north India. Recipes vary, but the basic ingredients of garam masala include coriander seeds, cumin seeds, green cardamom, cloves, cinnamon and nutmeg. Commercial blends are easy to find in ordinary supermarkets, but several classic recipes for making at home can be found here and here. The root stem of a tropical plant, fresh ginger is widely used in India to add a hot zesty bite and fragrance to dals, rice dishes, vegetable curries, pickles and chutneys, usually fried in hot oil to start a recipe but sometimes added raw. Avoid ginger with wrinkled darker skin or discolored spots — it is tougher and less vibrant. Dried ginger can be used in a pinch, but has much less flavor. A specialty of Maharashtrian cooking, goda masala is a wonderfully aromatic spice blend that is used to add a dry, earthy and hot seasoning to dals and vegetable curries. The basic ingredients of goda masala include coriander seeds, cumin seeds, cloves, cinnamon and sesame seeds. A recipe for goda masala can be found here. Unrefined cane sugar juice boiled down and cooled into soft semi-solid yellow-brown cakes. The sap of sugar palm trees is also sometimes used to make jaggery. Jaggery is used to make sweets and sometimes in spicy dals or curries to balance the heat, but is not cooked with milk as it causes the milk to curdle. Jaggery should be stored in a cool place or refrigerated. Mint leaves are frequently used in dals and vegetable curries, but the most common use of fresh mint is in the popular mint chutneys that are served with fried savoury pastries and breads (see coconut and mint chutney). Dried mint leaves are also sprinkled over dals, rice dishes and vegetable curries. Peppermint is the North American variety that is closest to the types of mint used in India. The dried fruit of a small herb, tiny black nigella seeds are aromatic and have a nutty, peppery and onion taste. Usually dry-roasted or fried in hot oil to enhance the flavor, nigella seeds are most frequently used in breads and salads, and are excellent with cooked potato. Nigella seeds are an essential ingredient in panch phoran. The seed of an apricot-like fruit, nutmeg has a powerful fruity and slightly bittersweet flavor and aroma. Nutmeg is found in spice blends like garam masala and used to flavor rice dishes, vegetable curries and sweets. Mace ( Javiti ) is the "skin" or aril of the nutmeg seed, and has a similar but more delicate fragrance and taste. Translating as "five spice", panch phoran is a common spice blend in east India and Bangladesh where it is fried in hot oil until it "pops" and used to season dals and vegetable curries. Bittersweet and highly aromatic, panch phoran goes especially well with potatoes, as in this recipe. Panch phoran blends are available commercially, but it is easy to make at home as it consists of only fenugreek seeds, fennel seeds, nigella seeds, cumin seeds and black mustard seeds in equal parts, does not require roasting or grinding of the seeds, and can be stored for months in an airtight container. The dried unripe berry of a tropical vine, black peppercorns are used as extensively in Indian cooking as they are are in other cuisines. Found in many spice blends, ground, crushed or whole peppercorns are used to flavor dals, rice dishes, vegetable curries and any other kind of savoury dish. White peppercorns ( safed mirch ) are nearly ripened before drying, and is hotter but less aromatic. Green peppercorns ( badi mirch ) are younger, immature berries and have a milder taste. The world's most expensive spice in its finest form, saffron is the handpicked stigma of the saffron crocus flower. The best saffron comes from Kashmir, where it is picked at dawn in late October, just as the flower opens. Most saffron sold in Western grocers is grown in Spain. When dried, saffron resembles small dark red threads and is sold in small flat boxes. Although expensive, only a few saffron threads are needed in any dish. The threads are soaked in water or milk and added to the liquid of rice dishes or milky sweets to impart a golden hue, a slightly sweet and musky fragrance, and a warm and slightly bittersweet taste. A hot and aromatic spice blend that — in addition to tamarind — is used to season sambars, a thick toor dal and vegetable dish that is served at the beginning of many south Indian meals. The basic ingredients of sambar masala include roasted coriander seeds, cumin seeds, fenugreek seeds, dried red chilies, black peppercorns, asafoetida and dried curry leaves. Commercial blends are available in Indian grocers, but a recipe for homemade sambar masala can be found here. Star anise is the dried eight-pointed star-shaped pod of a Chinese magnolia. The licorice flavor is similar to fennel seeds, but stronger and sweeter. Star anise is sometimes added to spice blends in place of fennel seeds, and is occasionally used to flavor rice dishes where it is discarded before eating. Star anise is also chewed to freshen breath. The dried fruit pulp of the pods of the tamarind tree, tamarind is sold in brown sticky cakes of dried pulp, as a concentrated paste, or in a liquid extract. When bought in cake form, tamarind is soaked in hot water for 15-20 minutes, after which it is pressed through a fine sieve to obtain the juice and fine pulp. Tamarind has a tangy and slightly sweet flavor similar to dried apricots, and a fruity aroma. Tamarind is essential to south Indian cooking, where it is used to flavor hot and sour rice dishes, dals, vegetable curries and sweet chutneys. The dark yellow or orange dried stem of a plant related to ginger, turmeric is sold whole or ground into a powder and has a pungent and bitter aroma and flavor. Turmeric is one of the most commonly used spices in India, and is used in moderate quantities to add a golden color and a subtle acrid flavor to many if not most dals, vegetable curries and rice dishes. A hot and sour blend consisting generally of coriander seeds, cumin seeds, dried red chilies, black peppercorns, cinnamon, ginger and garlic mixed into a paste with tamarind and vinegar. A relatively modern blend whose name is derived from the Portuguese "Vinha d' Alhos", vindaloo paste can be spread on potatoes and fried savoury pastries, or used to flavor almost any kind of vegetable dish. Along with dals and rice, vegetables are the centerpieces of Indian vegetarian cooking, appearing in one or more dishes at every meal. Indians cultivate a large variety of native vegetables and have been equally enthusiastic in adopting other vegetables from around the world in their cuisines — after all, neither chilies, tomatoes or potatoes are indigenous to the sub-continent. Along with the agricultural cornucopia, Indians have cultivated an enormous array of dishes, techniques and flavor combinations for using vegetables. Vegetables are added to dals and rice dishes, or combined with spices and seasonings and cooked until just tender or until soft in curries, or deep-fried, roasted, baked or stuffed, or minced and ground and fried into vegetable koftas. The following section lists vegetables that are commonly found in Indian dishes. Many of these are familiar to cooks around the world, while many others may be unfamiliar — drumsticks, bitter melons and ash gourds, to name just a few examples. Some of these more exotic vegetables may be difficult to find fresh in all but the largest of Indian grocers, while others such as bitter melon are usually available. However, Asian or Chinese grocers often stock many of these vegetables, while frozen, dried, canned or jarred options are frequently available. I have listed substitutes for the more difficult-to-find vegetables where appropriate. Leafy greens similar in appearance to spinach but with a more peppery flavor like watercress, amaranth is cooked quickly and added to dals and vegetable curries and soups. Amaranth leaves are commonly found in Asian grocers. Spinach or watercress may be substituted. Round gourds with a pale greenish skin and a white, mild and sweet flesh, ash gourd is frequently used in soups or cooked in fritters. Ash gourd flesh is very sweet and eaten as a fruit when immature, but the gourds are generally grown to maturity and cooked as a vegetable. Ash gourd may sometimes be found cut into wedges or thick slices in Indian grocers — watch that the flesh has not turned yellow. It is also commonly found in Asian grocers where it is sold as winter melon. Whole ash gourds will keep in a cool dark place for months, while wedges or slices should be refrigerated and cooked within a week. Pumpkin, zucchini or seedless cucumber may serve as substitutes depending on the use. Small red beets are most commonly shredded and added raw to salads or slaws, but are occasionally shredded or chopped and cooked in vegetable curries and soups. Beetroot leaves can also be cooked as a leafy green or chopped and used raw as a salad green. Remove beet greens (if attached) before storing, and refrigerate the root vegetables in plastic bags before using within 1-2 weeks. Green or red bell peppers are seeded and lightly fried or chopped finely and added raw to rice dishes, dals and vegetable curries, or battered and fried in fritters. Refrigerate bell peppers in a vegetable crisper and use within 5 days. Short or long oval gourds with a green skin covered with "warts" and ridges, bitter melon has a pale but firm flesh and a very bitter taste that is difficult to acquire for some. Young bitter melons have a bright green skin and are cooked and eaten whole, while older bitter melons fade into a yellowish color — the seeds and fibers should be scraped out of most bitter melons bought in stores, and the melons should be discarded once they start to turn yellowish. Bitter melons are grated raw into salads, fried into snacks, or added to spicy dals or occasionally to vegetable curries, although the taste of bitter melon does not accompany most other vegetables well. Indian and Chinese varieties of bitter melons are commonly available in Indian and Asian grocers, and are also sold frozen which does not affect the taste but results in a soggier texture. Chinese bitter melons tend to be larger with a slightly smoother and paler skin, and are a little less bitter than the Indian variety. Okra may serve as a substitute on occasions. Bitter melon is considered to have hypoglycemic and digestive properties, and is used to stimulate the appetites of sick or elderly persons. Long, pale green and smooth-skinned gourd with pale sweet flesh suggestive of zucchini or cucumber, young smaller bottle gourds are cooked whole and added to dals, vegetable curries and soups. Older and larger bottle gourds should be peeled and the seeds scraped out. Bottle gourds are often found in Indian and Asian grocers, where they are sometimes called long gourds. Zucchinis may be substituted. Shredded green cabbage is added raw to salads or slaws, or is lightly cooked and used in vegetable curries and soups. Red cabbage is less commonly used as the color tends to overwhelm the colors of other ingredients. Cabbage should not be cut before using, and should be refrigerated for keeping up to several weeks. Grated or chopped fresh carrot is added to rice dishes, dals and vegetable curries to add a vibrant color and slightly sweet taste. Grated carrot can be added raw, while chopped carrot is usually added to the cooking liquid of dishes to soften. Raw grated carrot is sometimes added to yogurt to make cooling raitas, a condiment used for balancing spicy meals. Choose carrots with a bright orange skin and discard carrots if they begin to sprout. Carrot greens should be removed if attached, and carrots refrigerated in a plastic bag for up to 2-3 weeks before using. Cauliflower is a popular vegetable in India where the florets are cooked until just tender or until soft and buttery. The aroma and flavor of cauliflower form excellent contrasts with seed spices, and cauliflower is frequently used in rice dishes. Curried cauliflower and potatoes ( Aloo Gobi ) is a very popular north Indian vegetable dish. Refrigerate cauliflower loosely wrapped in plastic for up to 2 weeks before using, and shave off brown spots. Florets can be cut from cauliflower heads and refrigerated in a sealed plastic bag for up to a week. Fresh or frozen corn is not widely used in Indian cooking, but lightly cooked can add a pleasant and slightly sweet finish to dals, vegetable curries or rice dishes. Baby corn is also added whole to vegetable curries or salads. Ground cornmeal or cornstarch are used to make breads, pancakes and puddings. Cucumbers are grated and added to salads, and are especially popular combined with yogurt to make cooling raitas, a condiment used for balancing spicy meals. English cucumbers are a preferred variety as they contain nearly no seeds. If using other varieties, scrape the seeds first. Cucumbers should be wrapped in paper towel and refrigerated, and can last 2-3 weeks. Large white radishes usually found between 1 and 2 feet long, daikons have the crisp texture of red radishes but a milder peppery flavor. The skin is usually scrubbed before grating the raw radish into salads or cutting into slices and cooking in dals and vegetable curries. Daikon radishes are easily available at Indian and Asian grocers. Red radishes can be substituted. Very long (about 2 feet) dark green bean pods of a tropical tree, young and tender drumsticks have a flavor suggestive of asparagus and are cooked similarly to green or yellow beans and added to dals and vegetable curries. Older drumsticks become hard and stiff — the flesh is scraped from the pods, and the pods are then discarded. Drumsticks are widely available fresh, canned or frozen in Indian and Asian grocers, although fresh drumsticks will most likely be older pods that require scraping — avoid bumpy or brownish pods when buying fresh, and use as soon as possible. Drumsticks are considered to be one of the most nutritious tropical vegetables. Drumstick leaves are also chopped and used as garnishes in place of coriander leaves. Eggplant is one of the most commonly used vegetables in India, and small round dark purple eggplants are found in every Indian grocer. 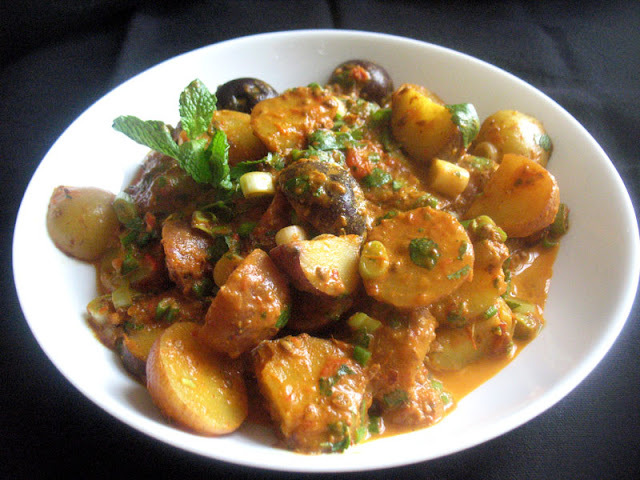 Eggplant is added to dal or vegetable curries, or roasted and mashed with spices, or sliced, battered and fried. Eggplants should be refrigerated and used within a week. Like onions and ginger, garlic is widely used for flavoring dals, vegetable curries and soups, and rice dishes. Garlic is minced (or crushed) and fried with onion and spices to start a recipe. Garlic should not be stored in a plastic bag, and should be stored in a cool dark place or refrigerated. Garlic should be discarded if it begins to sprout. Green unripe chickpeas are sometimes found fresh in the spring or early summer, but are always available frozen. Green chickpeas should be cooked very briefly, and are an excellent snack sprinkled with salt. Green chickpeas are also added to dals, vegetable curries and rice dishes. A small green squash with a smooth skin and pale green stripes, ivy gourd has firm pale green flesh with a taste suggestive of zucchini and cucumber. Ivy gourds are sliced or cubed and added to dal or vegetable curries and soups, or cut into strips and fried with spices. Ivy gourds may be difficult to find fresh, but can be purchased frozen. Refrigerate ivy gourds in paper or plastic bags and use within a few days. The root stem of an aquatic lotus flower, lotus root is peeled and cut crossways before cooking. The flesh has a mild sweet taste suggestive of artichoke, and remains firm and crunchy after cooking. Lotus root is more commonly found dried, frozen, canned or pickled than fresh, and can be found in Asian grocers as well. Mushrooms are not typically eaten in ordinary Indian households, but are popular in Westerized restaurant dishes such as mushroom pulaos and khumb matar (mushroom and pea curry). Fresh or canned white button mushrooms are most commonly used in these dishes. Mushrooms should be stored in paper bags and refrigerated, and should be used within a few days before they become brown. Do not clean or cut fresh mushrooms until using, and clean by gently wiping with a damp cloth or sponge. Slender, finger-length ridged green pods, okra is cooked whole in curries or stuffed with spices and fried. Okra becomes slimy if cut before being cooked, and should be wiped dry with a damp cloth instead of being rinsed under water. Select small thin pods and refrigerate for less than a week before cooking. Okra is easily available fresh or frozen. Onions are one of the most important vegetables in Indian cooking, and are widely used to flavor dals, vegetable curries, soups and rice dishes, often with garlic or ginger as well. White or yellow onions are typically chopped and fried with spices to begin a recipe, but are also occasionally added raw or slightly cooked at the end to add a sharp pungent taste to a dish. Onions should be stored in a cool, dark, dry and well-ventilated place, loose or in a mesh bag, and can last for weeks before using. If an onion has started sprouting, remove the sprout and cut into the onion to discard any greened parts of the core. Fresh or frozen green peas are lightly cooked and used to finish rice dishes and vegetable curries, including the popular matar paneer (spiced paneer cheese and pea curry). Large unripe cooking bananas with a thick green skin, plantains have a starchy and slightly sweet flavor. Plantains are usually fried, although they are sometimes baked with coconut and spices, or occasionally added to vegetable curries. Plantains should be stored in a cool dark place and should be used before turning yellow, although they will not become sweet like bananas when ripe. One of the most important vegetables in Indian cooking, potatoes are used extensively in curries and in snack foods like fried savoury pastries. The neutral and starchy flavor of cooked potatoes is an ideal vehicle for hot, salty or tangy spices. Avoid potatoes with a greenish tinge, and store in a cool dark place. Orange winter pumpkins are peeled, chopped and cooked and added to dals and vegetable curries, or mashed with spices. Pumpkins should be stored in a cool dark place and will keep for several months. Spinach leaves are very popular in Indian cooking, where they are added to dals, vegetable curries and soups, or served cooked and spiced on their own. Spinach is almost never used raw in Indian cooking. Sweet potatoes are used in dals, vegetable curries and in biryani rice dishes. Sweet potatoes should be peeled, either before or after cooking. Store sweet potatoes in a cool dark place. A starchy root vegetable with a dark skin and pale flesh, taro must be peeled before cooking, and is cooked either by boiling and mashing, or by frying. Taro is cooked with strong flavors like garlic, ginger or hot spices. Taro should not be consumed raw, and should be stored in a paper bag in a cool dark place. Fresh or frozen taro root is frequently found in Asian grocers. A small round light-green squash resembling a Granny Smith apple, with a firm texture and a mild flavor like summer squash. Tindas are peeled and seeded, and used in dals and vegetable curries. Tindas may be difficult to find fresh in Indian grocers, but can be found frozen or canned in brine. Zucchini or summer squash can be substituted. Firm ripe tomatoes are chopped and fried with spices until reduced to serve as the base for countless dal and vegetable curries. Turnips are fried or cooked and added to vegetable curries or rajma dal curries, or occasionally mashed with spices. Turnip greens can also be cooked as a leafy green and substituted for spinach. Remove the greens (if attached) and store turnips in a cool dark place for up to 2 months. You've done a truly amazing job explaining all the masalas and other ingredients used in Indian cooking. My American husband would be very glad. Thanks a bunch! Thats a huge effort...many thanks for this. I stumbled upon this page trying to find what a toor dal substitute....and still looking. Yellow split peas or channa dal would work. Thanks for visiting my blog. I hardly know where to begin. The best place is to say Thank You for all the powerful information you have shared with those interested in learning the what, hows, and when's of Indian cooking. I just discovered you website today (11/27/15) and I'm not overwhelmed (well, maybe a little! ), but overjoyed by doing so. I've had so many questions about the "how to's" and wish I understood more about the ingredients (so much to learn) and here you are! To say I'm grateful is an under statement, but I want to get back to reading so that will have to do! The days to come will be filled with joy and appreciation for both my husband and I as well our friends and family members. PS I'd prefer any email follow-up comments be sent to testarosa@embarqmail.com instead of my Google account, which I don't use. Thanks! I love, love beans and recently started cooking with Indian spices. While surfing for recipes, I ran across your web site. I only wish there were enough days to try them all! My coworkers are always curious to know what I have cooked and are amazed that there's so much variety when cooking with vegetables! I am overwhelmed with the amount of recipes here! I'm in heaven! Thank you so much. Your site and information is so wonderful!! !